Our Financial Aid Representatives specialize in personally assisting students who are interested in exploring their financial aid options. You can begin this process by letting your Admissions Representative know that you are interested in applying for financial aid. They’ll take care of setting up your appointment so you can focus on your education. Follow the instructions carefully. Get organized, gather your personal and family financial records and find a quiet location where you can work on the application. Last year’s federal tax return forms 1040/1040A/1040EZ and W2 forms. If you can’t find last year’s return, call the Student Financial Services Department and we will help you obtain a copy from the Internal Revenue Service. Bank account and investment statements. Information relating to income including wages, dividends, Social Security benefits, welfare payments, alimony and / or child support, Veterans Administration benefits and disability benefits. You must meet certain eligibility requirements to receive financial aid. 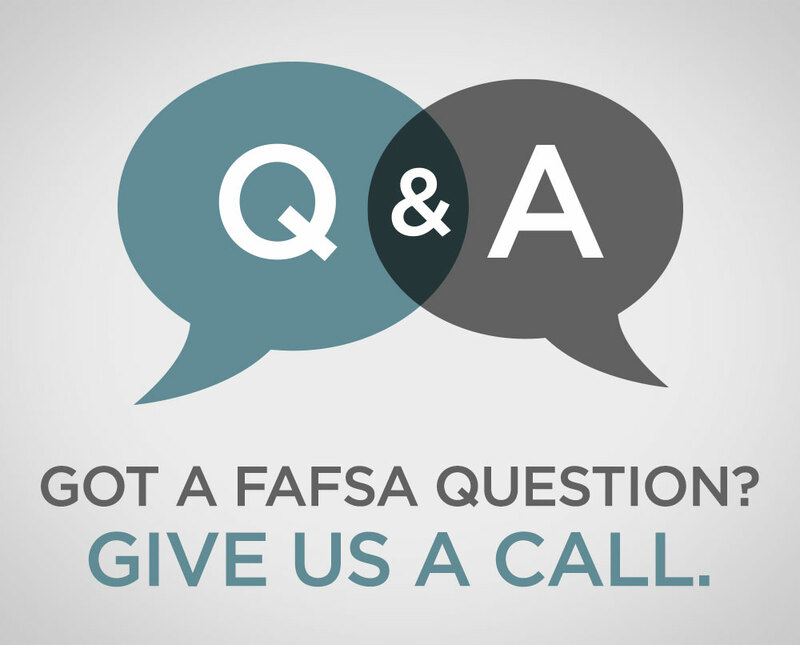 If you answer “yes” to any of the questions below, you are considered an independent student for federal financial aid purposes and your parents will not need to answer the parent questions on the Free Application for Federal Student Aid (FAFSA) form. If you answer “no” to all of these questions, you are considered a dependent student for federal financial aid purposes and your parents will need to answer the parent questions on the Free Application for Federal Student Aid (FAFSA) form. If you answer “yes” to any of the questions below, you are considered an independent student for federal financial aid purposes and your parents will not need to answer the parent questions on the Free Application for Federal Student Aid (FAFSA) form. Will you be 24 years old before December 31 in the academic year? Do you have legal dependents who live with you and receive more than half of their support from you (other than a spouse or children)? When you complete the Free Application for Federal Student Aid (FAFSA) form and indicate City College as your college of choice, we will receive an ISIR (Institutional Student Information Report) electronically. The ISIR will contain an EFC (Expected Family Contribution) figure. The EFC is determined by a set federal formula and relates to the amount that you (and your parents, if you are a dependent student) might be expected to pay for direct and indirect costs for one academic year. The EFC is used by the school to determine your eligibility for federal aid. All information provided to the school will be kept confidential. We are in compliance with the provisions of the Family Rights and Privacy Act of 1974. This law regulates the release of any personal information. Involve other family members who must provide information. For example, your parent(s) will need to complete the parent section of the form if you are classified as a dependent student for federal financial aid purposes. Remember to electronically sign the form with your PIN, this is essentially your secret number for FAFSA, also keep in mind that a parent must also electronically sign if you are a dependent student. Some aid is limited and is more likely to be available if you apply early. You will find the appropriate application forms in your enrollment packet. Continuing students should apply as soon as possible after the new annual FAFSA form is available online. Application deadlines are announced yearly, usually in January. All students must re-apply for financial aid each year, including a new FAFSA form. Apply for a FSA ID and password. Both parents and students need a FSA ID and password to sign electronically. Before mailing your federal income tax return each year, be sure to make and keep a copy. Complete your FAFSA at home or come to one of the financial aid workshops that will be announced on campus. Be sure to file early to meet all deadlines. The Federal School Code for City College campuses in Fort Lauderdale, Gainesville, Miami, Hollywood, and Online is 016839. The Federal School Code for City College campus in Altamonte Springs (Orlando) is 030799.